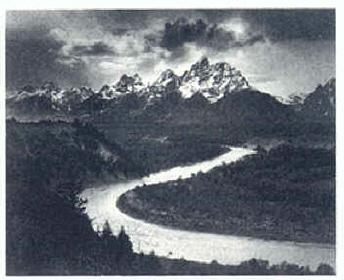 It is easy to enjoy the photographic vision of Ansel Adams. His images represent a lifetime's work of producing dramatic, mysterious and sensuous photographs. It is also easy to see why Adams' contributions to photography in the twentieth century were considered extraordinary. The celebrated American photographer known for his photographs of the landscape of the American West was born in San Francisco, CA in 1902. At the age of 14, Ansel Adams was inspired by a trip with his family to Yosemite, California, where Ansel would later return again and again to photograph the American wilderness in black and white. His pictures show enormous clouds, rugged mountains, vast deserts, and gigantic trees in sharp detail. Ansel Adams was also a prolific writer and lecturer, always stressing the great importance of image quality at every stage of a photographer's work. His commitment to photography led him to write the classic Basic Photo Books series, to help set up the first photographic art department of a museum at the Museum of Modern Art in 1940, and to establish the first college of photography at the California School of Fine Art. His books include Making a Photograph (1935), My Camera in the National Parks (1950), This Is the American Earth (1960), Ansel Adams: Images 1923-1974 (1974), Photographs of the Southwest (1976), Yosemite and the Range of Light (1979), and a series of other books on photographic techniques. The art of photography lost its founder when Ansel Adams died of heart failure in Carmel, California on April 22, 1984.